Here are some Tinkerbell birthday party ideas. You can make it simply a fairy party especially for younger toddlers who don't know Tinkerbell yet. Fairies are one of the most popular girl themes and there are so many ideas you can do to make this a perfect party. the most popular themes with girls. Tinkerbell and fairies are a popular theme for a girls party. Dress up in a fairy costume for fun and add accessories to match your party from favors, to balloons, plates and decorations. Fairy colors are purple, pink and green or chartreuse. Disney's Fairies Party Supplies from Birthday Express. Buy Costumes.com offers Tinkerbell Child Costumes. 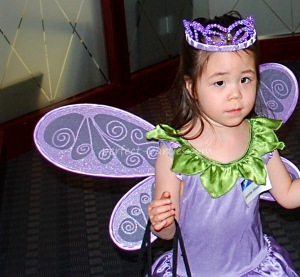 We found our fairy costume from Gymboree. Tinkerbell table cloth or pink tablecloth sprinkled with colorful sequins. Tinkerbell or Fairy Balloons and streamers. Tinkerbell posters or birthday banners. Clear Christmas lights will add sparkle to the room. Wands, rings tiaras and bracelets. Chocolate covered strawberries. You can mix red or purple food coloring in white chocolate to make them pink and purple. Headband Cute Make and Take Fairy Headband Add buttons, silk flowers or rhinestones. Click on link or photo for complete directions. Water Globe Cute Make and Take Tinkerbell Water Globe using cake toppers and baby bottles. Click on link or photo for complete directions. Nail polish and glitter make up for older girls. There are some girl salons that specialize in making the birthday girl and friends into pretty divas. Pin the Star on Tinkerbell's Wand. Enlarge a picture or use a poster and hand a star out to each child with a piece of tape on the back. Blindfold and have them pin the star on her wand.